We have two sets of babyphones, one that is stationary and stays in N’s room, the other one is running with batteries and more suitable when travelling. What I love about our “Travel Babyphone” is that I don’t need to pack the stationary with when going on a trip, the travelling babyphone is also much smaller and it works pretty well. If you are actually not travelling so much, a babyphone App will do. The great thing about the App is, that you have a much wider reach because it’s working on the Internet Network. I wouldn’t use it too often though because the frequency waves can be harmful for your baby’s brain. My husband had a more sustainable idea, which was the App called ‘White Noise’. You can create a personalised white background noise and play it via bluetooth speaker. When travelling, we always take our JBL portable bluetooth speaker with and I’m also quite certain that this will become a great music player when baby N gets bigger. Another side effect of the white noise is, that it’s working as a soft soundproof for the room, so small noises won’t be heard much. For our first and second New Year’s Eve this little white noise worked miracles, because we would turn up the volume higher than usual so he wouldn’t wake up from the noise outside! When N was born I got asked so many questions from my lactation consultant and doctors like: how much did he sleep last night? How long is he breastfeeding? How many times he napped today? etc. And to be honest it wasn’t easy to keep track of the exact times because it felt like all he did was eat, sleep and poop. Therefore the App “uGrow” by Philips Avent really helped me keeping track. Especially when it came to breastfeeding it was just great to know which side was next or which breast pumped more milk. It was a great tool for the first months when you also get to know your baby and it gives you a better impression on their daily rhythm. Later I also used the App “Wonder Years” based on the book, which would explain me baby’s development and different stages of phases. This was also great in the beginning to figure out which days might be better or easier for travelling or when it would be better to just stay at home. Lastly I also loved the App Babycenter. I used it mainly throughout my pregnancy to see what stage of development my baby was or what size of fruit it currently is. Later, when Baby N was born, it was a great source of information on his development stage. I learned when he could start seeing better distances or how to entertain and play with him. Ideal in-home humidity levels should hover around 45%.Anything under 30% is too dry, over 50% is too high. There are great and easy fixes for your home that don’t require you to buy anything. Same applies when you are travelling. To increase humidity just place a glass of water on the radiator, or leave the window closed while showering. Decreasing humidity is a bit more tricky. I’ve read that keeping doors and windows closed will keep humidity from entering your home. Also it is recommended to open your window when cooking or showering so the humidity caused can get out. Sidenote: Please bear in mind that a humidifier might indicate a higher level of pollution in your home, because of the water particles. Therefore it is recommended to use filtered water. The Xiaomi Smartmi is not available in Europe but you can purchase it from China. A nightlight is essential for you and your baby, even more if you share a room together. Our stationary babyphone has a nightlight integrated which is giving the perfect soft, warm light you’ll need during night. When travelling, our travel babyphone also has an integrated night light, which is great but sometimes I love a little extra light, because a hotel room is an unknown environment. I love bringing the star by “a little cute company” with. It gives great light when needed and dims by itself after about 10 minutes. One of the most important gadgets is a thermometer, because you’ll definitely need it not only for when they are babies but also when they are toddlers and children. We bought an ear-thermometer from Braun, because it had the best reviews. 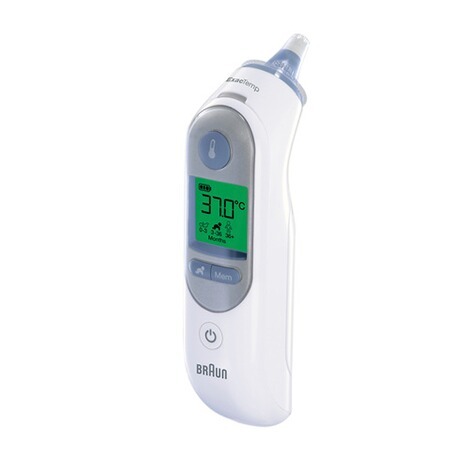 It is a big device as such, which is why we also have a regular digital thermometer. These are our basics when at home or travelling, so let me know in the comments below what you think is missing on the list. Have a wonderful week-end ahead!